The RIT campus was awash in grief and shock after a student suicide on Oct. 31, 2018. In the days following, RIT's administration came to find that the student body felt little support for their emotional well-being. Students had come together in an unprecedented way, demanding better mental health services. Before the incident, the staff at Counseling and Psychological Services (CaPS) were confident in the quality of services they provided. The staff included two case managers — a position that isn’t often seen in universities. Case managers work to help students navigate both on and off-campus resources in order to best address a personal problem. This includes referring students to off-campus services, helping with insurance and ensuring graduating students will continue to receive treatment. To some extent, the CaPS staff has also worked toward creating a supportive network for students. Kristina Walker, the CaPS outreach coordinator, meets with RAs to speak about mental health needs and how to support students in distress. She also works to educate faculty. “We also have gone in to meet with new faculty and former faculty ... to provide early intervention trainings and information about mental health trends — and why it’s important, as the faculty on our campus, to be very aware of the mental health concerns that students are coming in with ...” said Walker. Walker reviews the resources to which faculty can direct students in distress. These available resources are offered by CaPS in a few forms: individual therapy, group therapy and walk-in hours. Individual therapy is short term, as a result of CaPS operating under an “access model.” This is a structure that allows a large amount of people to meet with a therapist for a short amount of time. Walk-in hours are a recent product of this access model. “Every hour of the business day, operating 8:30 a.m. to 4:30 p.m., we had someone on walk-in duty ... and then last year we doubled that. We had two clinicians available on walk-in hours throughout the day,” said Dr. David Reetz, the CaPS director. According to Reetz, 904 walk-ins were provided in the 2017–2018 school year, with a 61 percent increase in walk-ins by October 2018 as compared to the previous year. Walk-in hours allow students to talk with a professional about stressors that don’t need to be continuously addressed. For students who need individual therapy, it usually lasts five to seven sessions. The first session is an intake appointment. Based on the intake appointment, a student may be recommended to participate in group therapy. Groups currently available are for general anxiety, transgender students seeking support, social anxiety, stress management, relationship difficulties, addictions and graduate students seeking support. “[Available groups] kind of come and go depending on what the presenting needs are that we’re hearing, if there’s enough students for it and depending on clinician schedules,” said Reetz. Group therapy is weekly and can be one to one-and-a-half hours long — more treatment compared to individual therapy, which is one hour every two to four weeks. Because individual therapy is short term and the appointments have weeks in between, CaPS will refer many students off campus. “If a student would benefit from more frequent appointments because their symptoms are intense, because there are a lot of things that they want to work on or if they are used to [having] weekly appointments ... those are good cases that would fit off-campus [resources],” said Walker. Following the incident on Oct. 31, 2018, Senior Vice President for Student Affairs Sandra Johnson sent out vague emails to the RIT community. However, the news of what took place had spread quickly among students. A petition was started on Change.org by third year Bioinformatics major Caitlin Pope on Nov. 1, 2018. Within four days, it gained over 9500 signatures from RIT students, RIT alumni and concerned friends and family. A similar petition on PawPrints, created by fifth year Computer Engineering major Taikhoom Attar, rapidly gained over 3000 signatures — the most of any PawPrint in history. On Nov. 1, 2018, President David Munson sent out “a message of caring,” announcing additional support services for emotionally-distressed students. On Nov. 2, 2018, RIT administration held an open forum, allowing students to voice their concerns and offer their own ideas. The location was changed from Fireside Lounge to Ingle Auditorium to accommodate a far higher attendance than expected. Meanwhile, dozens of students were meeting up on their own to discuss the need for various CaPS improvements and how to go about demanding change. Students have voiced concern that CaPS doesn’t provide enough mental health support as a result of under-staffing. Students who are aware of this under-staffing issue sometimes deny themselves the opportunity to seek help. Students have also criticized CaPS for the long wait times between appointments and the delay in the intake. “Two semesters ago, due to some personal stuff, I tried to make an appointment with [CaPS]. I just wanted somebody to talk to because otherwise I would have to internalize it all. But they gave me an appointment something like five or six weeks out. Five or six weeks later, I cancelled the appointment because I didn’t need it anymore,” said Attar, the creator of the PawPrints petition. Attar found that the largest problem was a lack of staff. This can cause those who are not an imminent danger to themselves or others to be pushed off, and their appointment delayed. Pope touched on her experience with CaPS’s wait times, stating that she had to wait four weeks for an intake appointment and that she knew of other students who waited for months. CaPS's shortcomings have been partially blamed on the RIT administration refusing to allocate enough funding to the health center. Some students at the open forum criticized the administration for their move to rebrand the university and their announcement of a $1 billion campaign, while CaPS is understaffed and overbooked. Attar started his PawPrints petition partly because he noticed that CaPS had insufficient funding. Pope’s petition highlighted the lack of funding for the health center, as well. Students are demanding change in myriad forms. 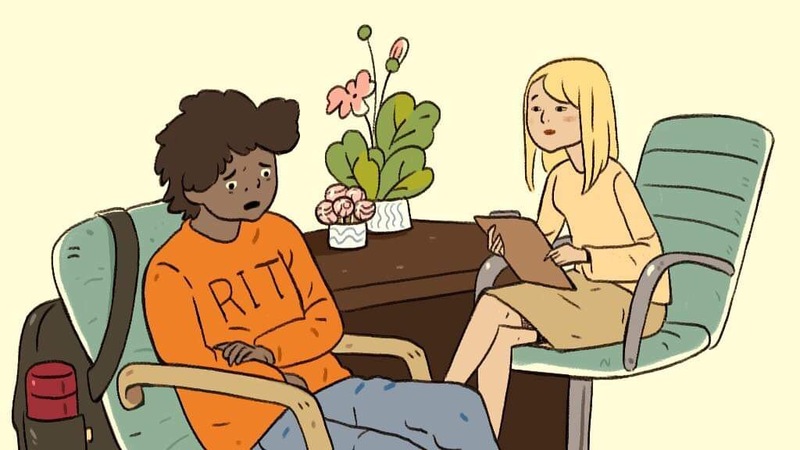 There has been demand for more counseling staff, counselors with more diverse backgrounds, shorter wait times and more funding for the health center. “Obviously, [I would like to see RIT administration] bringing more counselors on,” said Trossman. He also discussed the idea of having peer counseling, where students can talk to other trained students if they are “having a bad day” or experiencing minor stressors. This could potentially “alleviate some of the stress on the counselors.” Looking beyond administrative policy, Trossman also spoke on the cultural change necessary to ensure student wellness. Pope also shared the changes she wants to see from the administration. “I think that in general, [RIT] needs to reprioritize their thoughts of where the money should go and concentrate on the student health center in general, [which] needs to be funded,” she said. On Nov. 5, 2018, Munson announced a variety of enhancements that will be made to mental health resources on campus. So far, the administration has been keeping their promises. On Nov. 9, 2018, Student Government (SG) President and fourth year Environmental Science major Bobby Moakley gave a statement on mental health services. It was unanimously endorsed by SG. On Dec. 19, 2018, the RIT administration followed the statement and announced the creation of a University Task Force on Student Mental Health and Well-Being. The newly-formed task force includes representatives of students, faculty and staff. This integration of RIT’s various pieces is a step toward becoming a university that is fully invested in its students’ well-being. However, fully addressing the student body's mental health needs requires the collaboration of every faction of student life and the support of each person within RIT’s administration. The JED Foundation is a nonprofit organization that works toward improving the emotional health of American teens and young adults by preventing suicide and lowering substance abuse. Dr. Nance Roy, chief clinical officer of JED, discussed the need for the formation of a very inclusive multidisciplinary team. With the lasting systemic change that the student body is looking forward to, the task force best serves as a simple first step. Supporting this campus’s mental and emotional health requires continuous collaboration and advocacy from many. According to the announcement, the task force will be reviewing “campus programs, services and education efforts.” Often though, campus culture can play a key role in a student's emotional well-being as well. So, it is important for the task force to review the current services in place, but an assessment of faculty-student relations would allow for a more comprehensive review. Are our faculty equipped with strategies to approach students who are struggling? Do students feel that they can reach out to faculty and staff for support when they are having a bad day? These sorts of questions should be asked to help us understand how our campus culture may be hurting our emotional well-being. Along with campus culture, JED suggests a review of university policy. Some policies may create obstacles in a student’s life, worsening emotional distress. “[JED] reviews all [university] policies as part of the program,” said Roy. “So, we would want to be looking at the policies around 'how do they best serve students.'" One example given by Roy was that students who take a medical leave should be supported by having accommodations. This sort of policy review ties back to the importance of having individuals in the president’s office supporting and working toward improving emotional well-being for students. RIT isn't alone, either. Other schools have faced similar issues. There is opportunity for collaboration with our peer schools and even universities who have partnered with JED. Communication is key. “If the school is wanting to develop a program or protocol, it can be very helpful to talk with other schools who have already been successful with that issue. And they can learn from them instead of having to reinvent the wheel,” said Roy. Once we have implemented new policies, programs and services, there is also the need for a continual process of reviewing and modifying the changes made. Moving forward will take time, collaboration, administrative support and a shift in our campus culture. Moving forward means learning how to become an incubator for greatness in realms beyond just academics.